Wouldn’t your kids have fun giving YOU a grade? 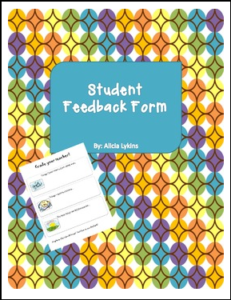 This is a quick form for kids to fill out letting you know how they feel about how the class is going. It gives them a chance to feel like their voice is being heard and gives us a chance to hear from those kids that may not always speak up. Plus it is a great way to find out about the climate of your classroom and allows us to step back and re evaluate our procedures and practices.